Glossy Gold Male Mannequin with Athletic build. 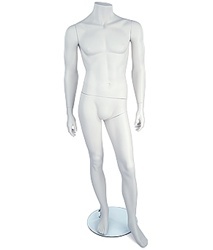 Good looking male mannequin with well defined body features posed with his hands at his waist. Made of Fiberglass. Includes base with foot support and calf rods. Glossy Gold color will make your displays pop!